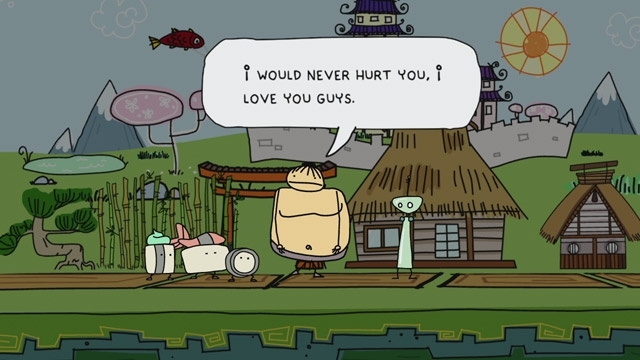 Doki Doki Universe is the story of a robot named QT-3, who needs to learn about humanity. He has his guide, Alien Jeff, and his balloon companion, Balloon. He also has a special little girl he hopes to find again one day. QT-3 explores different planets of the galaxy to learn more about humanity. He learns about hings like dreams, bullying, discrimination, love, acceptance, and a whole bunch more. 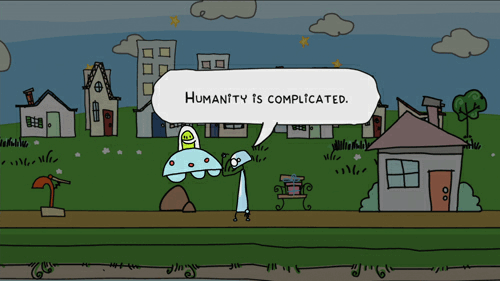 The main mechanic of the game involves traveling from planet to planet, solving problems and talking to people (or sometimes creatures). Some of them will have specific requests, like helping them start a robot vs demons club, or finding colorful ice cream. Some of them may want a hug, or want you to dance with them. As you explore the worlds and interact with characters, you'll receive treasures. Some of these are "summonables" which are gifts that you can give to the characters. You can greet characters by bowing, waving, or blowing kisses. You can also pick characters up and fling them, levitate, and rumble the world, causing a small earth quake. Be careful though, because not all characters like these things. Each character will have a "like" and "dislike" section that can be discovered through gameplay, and some characters will give you presents when they either love you or hate you. You can also earn customization items to bring back to the Home world. These range from trees and houses to other odds and ends, depending on what theme you'd like the Home world to fit. When you complete a world, you can use its background to customize your Home world as well. You can also unlock new avatars and flying space steeds. You can turn QT-3 into anything from a cat robot to a lumberjack robot, and your steed can be a flying pig or a cup of hot cocoa. Whatever floats your boat! You'll also receive messages from characters in the game, and you can take personality tests on little asteroids throughout space. These are usually 3-5 questions, and answering them gives a personality assessment. Dr. Therapist compiles a personality profile for you depending on your test results, and this profile grows the more tests you take. It should be noted that purchasing the game on the PlayStation Network doesn't give you the full game. The stock game only contains around half of the personality quizzes, and two-thirds of the worlds. The rest of the content is available as reasonably priced downloadable content, but you should be warned that you can't finish the game without further purchases. That being said, the base game itself isn't very expensive, costing only $14.99 USD. 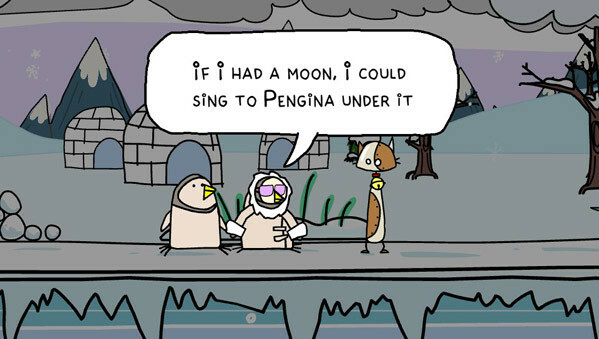 I really enjoyed Doki Doki Universe. 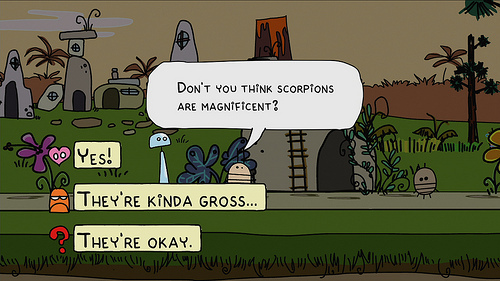 It's cute, it's sweet, and the gameplay is very laid-back. It's not big on action and drama if that's what you're looking for, but it will make you think about things and has it's touching moments. Overall it's silly fun, and easy to pick up and play any time. You can also play on your Vita if you have it purchased on your PS3 or PS4. I did not like that a portion of the game was separated into DLC though, as I would much rather have just bought the whole game at once; I still haven't gotten around to buy all the DLC yet. But it was a fun game, if only a bit repetitive and with slightly awkward controls. Overall, I had a lot of fun.